Some individuals have tried to simplify product development into two neat, pithy phrases: “choosing the right project” and “doing the project right.” These statements oversimplify the goal and imply that the work, coordination, and decisions involved in choosing the right projects and doing the projects right are simple and straightforward. The truth is, product development is much more than these two tasks, and to see that, we only need to look at who is involved in product development. Virtually every department in an organization is touched by product development, meaning that multiple people, functions, processes, and infrastructures must be coordinated. As a result, product development is complex and needs to be managed as a system. 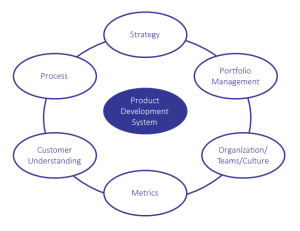 In consulting with clients, we have always treated product development as a system (PD Elements™), integrating these important elements: strategy, market understanding, process, teams and organization, portfolio management, and metrics. On occasion, we have worked with some clients that want us to “just look at the product development process” to fix their time-to-market issues, poor performing products etc. We wish it could be this easy, but it isn’t. Take a moment, and look beyond just the process, all the system elements are very relevant in ensuring that product development is successful within your organization. I’m interested in hearing if you think one system element is more important than the other in product development.